The late Jack Tenzel founded Hermitage Distribution Company in 1944. The company started in a converted house that was originally located at 1402 Church Street, and in 1946, the name was changed to Hermitage Electric Supply Corporation. In 1954, Tenzel’s son-in-law, Gerald Fleischer, joined the company and subsequently became president in 1965. In 1958, Hermitage Electric Supply Corporation was out of space and moved to 1303 Demonbreun Street. This new building had 16,000 square feet and added a kitchen division to the mix of lighting, appliances, and electrical supplies. In 1965, Hermitage Electric Supply Corporation had a 300 percent sales increase primarily due to the growth of its appliance distribution. A new interstate (I-40) was to be located through the current location, which led to the search for a new location. Land was found and purchased for construction at 531 Lafayette Street. The Grand Opening was held with great fanfare in October 1968. There was a ribbon cutting ceremony with Dr. Pauline Tenzel, Tom Fuller of Thomas Lighting, Lt. Governor Frank Gorrell, and Doris and Gerald Fleischer. 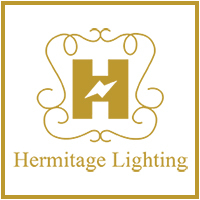 The newly constructed facility, with 16,000 square feet, is the current location of Hermitage Lighting Gallery. In 1974, Hermitage Electric Supply Corporation acquired 500 Lafayette Street to handle the need for additional space for distribution to the 80 dealers Hermitage then served. That year, Hermitage Electric Supply Corporation brought in a data processing center, and computerization has been and still is a main focus for Hermitage Electric Supply Corporation. This new property was to house two divisions of the company; it contained the Appliance Distribution with offices and an isolated dealer showroom and warehouse along with showrooms for Hermitage Kitchen Design Gallery. This new property was directly across the street from the company’s 531 Lafayette Streets location. This gave added space for the Lighting Gallery to expand. In September 1983, current president Jack Fleischer began working at Hermitage Lighting Gallery under his father’s guidance and training. In 1986, the Lighting Gallery at 531 Lafayette Street had 24,000 square feet added to its building, and it experienced a 35 percent growth in sales its first year. That year there was a change in our Appliance Distribution with KitchenAid going direct and then JennAir following that lead in 1992. Both divisions that occupied 500 Lafayette Street showroom where combined into 531 Lafayette Street. The showroom at 500 Lafayette Street was leased and two other contiguous warehouses were purchased. The warehouse at 500 Lafayette Street housed our National Accounts warehouse. Nashville Radiator was purchased in March of 2008 to enlarge parking for 531 Lafayette Street, and in 2009, the warehouse at 500 Lafayette Street and the two other contiguous warehouses were sold. 3640 Trousdale Drive, a 60,000 sq. ft. warehouse and offices on three and one half acres, was acquired. Today, Hermitage Electric Supply Corporation is located at 531 Lafayette Street and 3640 Trousdale Drive in Nashville, Tennessee. Jack Fleischer succeeded his father Gerald as President in 1996. Gerald Fleischer passed in 2007. Today, Tenzel’s daughter Doris Fleischer serves as Secretary/Treasurer and Jack’s wife Daniella began working with the company August of 1987, in the Marketing Department. Their son Matthew began working for the company in May of 2015, and their daughter Rachel joined the company in August of 2017. Hermitage Electric Supply Corporation’s main building is 40,000 square feet and has six businesses under this roof. The Lighting Division, Appliance Department, Electrical Division, Hardware Division, Internet Division, and Kitchen and Bath Division all share the same showroom and serve the residential building and remodeling segment of the Middle Tennessee and Southern Kentucky markets. The National Accounts Division is located in an 80,000 square foot building at 3640 Trousdale Drive. This serves as a distribution point for appliances and the commercial lighting packages, as well as hospitality markets with lighting and design needs. Hermitage Lighting Gallery is the winner of the Reader’s Favorites Awards in Greater Nashville House and Home, a Home Decor winner in Best of Citysearch, Nashville, and an ARTS finalist. Whether you need new light fixtures, home decor, appliances, or custom design, come to Hermitage today!